I noticed in Target’s circular this morning a box of Q-tips for sale. 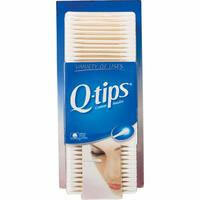 The box contains 750 Q-tips for $3.79. I don’t know about you, but I don’t clean my ears out every single day. 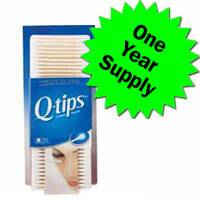 Why not advertise this box as a whole year’s worth of Q-tips? Or something to the tone of “Clean ears for less than a penny a day”. Make people think about exactly what they are getting compared to the cost. I think a year’s supply sounds pretty enticing, especially for less than four bucks. Work just installed a new paper towel unit in the bathroom and I have to admit, I don’t like it. It’s one of those hands free units similar to the picture below, but it does not have a sensor. You have to pull the sheet yourself. This would be fine if the system worked, however with wet hands you end up tearing little pieces of the towel off instead of the entire towel. The bathroom ends up littered with scraps of paper. Overall the system is pretty frustrating. There is no way to get an entire sheet out without ripping the corners. Spend the extra $50 and get the sensor. If you can’t aim, use a urinal or have the decency to lift the lid. There is NO reason for little yellow dots to cover the entire seat. Honestly, an office bathroom probably gets the most traffic between 9:30-11 AM and within an hour after lunch. Why in the world would you close the bathrooms from 1-2 for cleaning? Maybe its a conspiracy to make lunch-goers take a few flights of stairs to get to another restroom and work off some of that lunch.